This chapter discusses responses to severe structural problems faced by postindustrial cities in developed countries. The driving force behind this development is deindustrialization and the need to find ways for compensating the job losses in manufacturing. The research question is: how can smart platforms support innovative local economic restructuring. 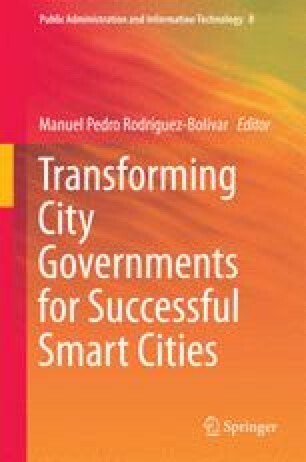 The chapter starts by discussing the restructuring challenge and introducing smart city as a framework for responding to such a challenge. The following section directs attention to platforms that support local policy making and governance, shedding light on the question of how platform approach contributes to the success of urban restructuring. Discussion is explorative and thus mainly theoretical, but utilizes exemplifications of local platform design. In addition, discussion is concretized by taking a closer look at one of the “innovation factories” of Tampere, the New Factory and one of its platforms, Demola, which exemplify the new trend in platform building. They highlight how platforms may help in increasing smartness in local economic restructuring. Bessonova, A. (2011). How startups are built in Tampere: Case of demola. ArcticStartup, September 01, 2011. http://www.arcticstartup.com/2011/09/01/how-startups-are-built-in-tampere-case-of-demola. Accessed 25 Jan 2014. City of Tampere (2010). Web site of the city of Tampere. http://www.tampere.fi/tampereinfo/ajankohtaista/5pz6R2Y6i.html. Accessed 31 Dec 2013. Davey, T., Deery, M., Winters, C., van der Sijde, P., Kusio, T., & Rodríguez Sedano, S. (2011). 30 good practice case studies in university-business cooperation. Part of the DG education and culture study on the cooperation between higher education institutions and public and private organisations in europe. In T. Davey, T. Baaken, M. Deery, & V. Galan-Muros. Brussels: European commission. http://ec.europa.eu/education/higher-education/doc/studies/munstercase_en.pdf. Accessed 28 Dec 2013. European Commission. (2012). Guide to research and innovation strategies for smart specialisations (RIS 3). European Union, Regional Policy, May 2012. http://s3platform.jrc.ec.europa.eu/c/document_library/get_file?uuid=a39fd20b-9fbc-402b-be8c-b51d03450946&groupId=10157. Accessed 28 Dec 2013. Gawer, A. (2010). Towards a General Theory of Technological Platforms. Paper presented at the Summer Conference 2010 on “Opening Up Innovation: Strategy, Organization and Technology” at Imperial College London Business School, June 16–18, 2010. DRUID. http://www2.druid.dk/conferences/viewpaper.php?id=501981&cf=43. Accessed 28 Dec 2013. Koliba, C., Zia, A., & Lee, B. H. Y. (2011). Governance informatics: Managing the performance of Inter-organizational governance networks. The Innovation Journal: The Public Sector Innovation Journal, 16(1), article 3. (http://innovation.cc/scholarly-style/koliba_governance_informaticsv16i1a3.pdf. Accessed 13 Oct 2011). Matikainen, J. (2012). Uusi tehdas/New Factory. Yhteenveto 2012 (Summary 2012). Uusi Tehdas/Hermia Oy. http://www.avointampere.fi/site/assets/files/1002/avoin_tampere_uusi_tehdas_raportti_2012_v1_1.pdf. Accessed 30 Dec 2013. New Factory. (2013). Uusi tehdas/New factory. Web site. Tampere: New Factory Ltd., Hermia Group. http://newfactory.fi/. Accessed 28 Dec 2013. Salomaa, A. (n.d.). Innovation in higher education: Case demola co-creation platform for talented students, companies and universities. Demola network. http://ec.europa.eu/education/events/2013/20131118/salomaa_en.pdf. Accessed 25 Jan 2014. Sefertzi, E. (2000). Creativity. Report produced for the EC funded project INNOREGIO: dissemination of innovation and knowledge management techniques. January 2000. http://www.adi.pt/docs/innoregio_creativity-en.pdf. Accessed 11 Oct 2013. Tredea. (2014). Innovaatiotehtaat (Innovation Factories). Tampere: Tampereen kaupunkiseudun elinkeino- ja kehitysyhtiö Tredea Oy. http://www.innovatetampere.fi/innovaatioymparisto/innovaatiotehtaat/. Accessed 7 Jan 2014.